Easy to digest, easy to absorb. Gluten, Soya, Egg and Milk free. This product is made from peas, from which the protein is extracted and concentrated. This unqiue process produces a protein that is highly soluble and therefore easy to digest and absorb. 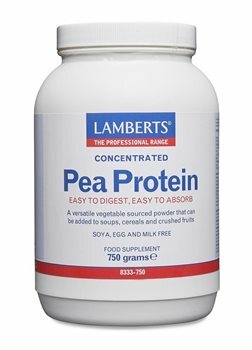 Pea protein is a rich source of the branch chain amino acids (leucine, isoleucine and valine) and is the richest natural source of the amino acid arginine. Alanine - 0.62g, Arginine - 1.70g, Aspartic Acid - 1.72g, Glutamic Acid - 2.92g, Glycine - 0.63g, Histidine - 0.47g, Isoleucine - 0.73g, Leucine - 1.44g, Lysine - 1.23g, Methionine - 0.13g, Phenylalanine - 0.85g, Proline - 0.72g, Serine - 0.91g, Threonine - 0.64g, Tryptophan - 0.28g, Cysteine - 0.12g, Tyrosine - 0.63g, Valine - 0.70g. A 20g portion of this product is generally recommended and can be measured out as two heaped dessertspoons. Protein contributes to the growth and maintenance of muscle mass. This product can be used to boost overall protein intakes and, in particular, the intake of branch chain amino acids. Depending on the amount of first class protein in your basic diet you can consume one 20g portion or two portions (40g) per day. This product can be used as a high protein meal replacement; try a 20g portion in a milkshake or mix into crushed fruit to make a healthy light meal. This product has a very low glycaemic index and so will help to prevent rebound hunger that can follow some carbohydrate rich meals. One 20g portion per day can make a significant contribution to your diet. Up to two 20g portions can be taken per day. A low appetite can compromise your ability to recover from illness, You need plenty of protein and calories as well as vitamins and minerals to help your body recover. We always recommend that you eat a range of different wholesome foods and consider taking a good multivitamin and mineral supplement, particularly if you have a low appetite. This product has a mild, slightly savoury taste and when added to soups or stews it will also have a thickening effect - so you may need to add extra liquid if you are following a recipe. Add the protein powder at the end of the cooking period, just before eating. Simply sprinkle it in and stir well. This product mixes quite well with muesli style breakfast cereals. Just stir it into the dry muesli before adding the milk. This protein powder can be mashed or blended into any fresh fruit. The mild savoury taste will be most effectively 'lost' if only 10g of Protein powder is mixed with one portion of fruit such as a banana. The Protein powder dissolves well when blended into milk shakes; 10g can be easily mixed into a small milkshake, and 20g into a large milkshake. Take as directed, or as advised by a practitioner or pharmacist. Free from wheat, gluten, dairy products, egg, soya and animal products. Un servicio y una atención realmente buenos, en cuanto al producto, posee una calidad bastante alta.Eso sí, al tener un sabor neutro no resulta el producto ideal para la elaboración de batidos rápidos. i am very satisfied,i had to get used to the ""no taste""
but this is my second jar,i got used very fast. I´m very glad with the quality of the purchased product as well as with the delivery and supported information all around the delivery procedure . Rather tasteless but effective. An excellent gym protein supplement which is easy on the stomach maybe due to its lack of lactose.